Kalo Pascha! Today is Orthodox Easter and all around Greece people are celebrating with feasts (lamb, of course). There will also be a lot of red eggs – symbols of blood and rebirth. It is the custom here to tap the tip of a red egg against someone else’s egg. The one whose egg does not crack, naturally, receives good fortune. I posted an Easter related image last year that makes me smile. 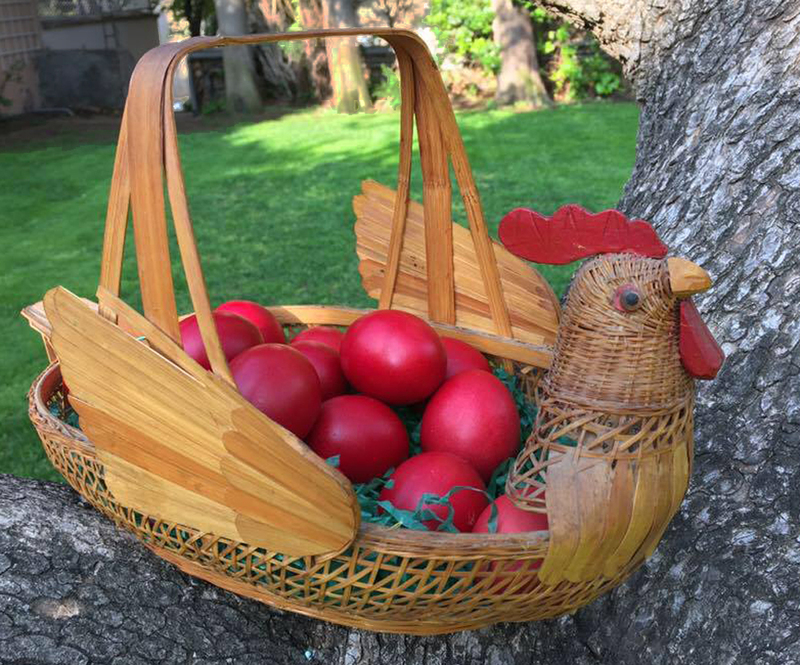 A straw hen basket roosting in a tree, filled with red eggs. Smile: The Daily Post’s Weekly Photo Challange. I do enjoy any kind of celebration and the traditions attached to them – something for the anthropologist in me. It is a wonderful opportunity being able to experience Orthodox Easter here in Greece. Hope your Easter celebrations were equally wonderful! It’s a cute basket that comes out of the closet once a year! A belated Kalo Pascha Debi. Nice chook with beautiful dyed eggs.